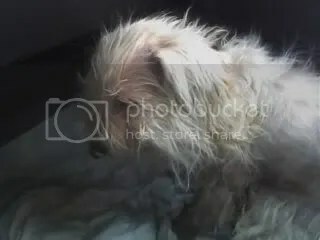 After a week’s long stay at the IVH, stitches, grooming and shots, the dog in my previous post is doing well and is at the PAWS shelter. My many thanks to the wonderful people at PAWS for all of their help and putting up with endless phone calls from me. I have to talk myself out of visiting her because I know I would pick her up and take her home with me. And that wouldn’t be fair for the dog because we’re usually gone during the summers and she would be left with my housekeeper who isn’t loving towards the three pets I already have. I hope she finds a good home. I heard that she’s still shy and withdrawn but I can tell you that she has a wonderful loving nature. 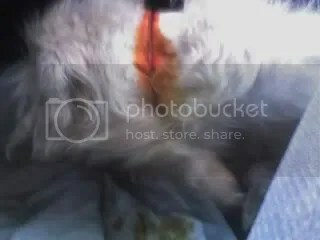 Not once did she growl or try to nip the vet when he was cleaning out the gashes in her neck. Last but not least, thank you all for your wonderful comments on the last post. Blessings, even the virtual ones, are always a pleasure to receive. Who am I kidding? I feel like that on most days. I remember seeing a sloth or two in Caracas many moons ago. There was one in a park, trying to climb a statue, most likely of Simón Bolivar. It was weird seeing one in the middle of the city. You wonder how a sloth, as slow as they are, made it past highways and busy city streets. Just an FYI but the Spanish word for sloth is perezoso which literally translates into: lazy. 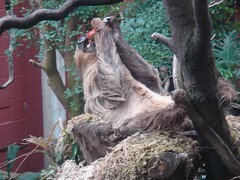 Next lifetime, I’m hoping I come back as a sloth so I can just lounge in trees and nibble on fruit all day long. Sounds ideal.